Bringing you a functional, natural-looking solution for missing teeth! Let our talented team get to work so you can enjoy permanent implants. Tooth gaps plummet self-esteem. Dentures can really cramp your style. If you have lost one or more teeth in your life, it is time to look for a permanent solution. Instead of suffering from embarrassment or difficulty chewing, consider dental implants. Dental implants are the closest restoration to natural teeth the dental industry has created. At Sheridan Dental in Grove City, Dr. Sheridan and his team feel implants are the ideal way to replace missing teeth. Implants also offer an often overlooked advantage. Since they are attached to the actual jawbone, jaw bone loss is prevented. This is a major concern for denture wearers. Finally, implants for tooth replacement help keep the bite stable and prevent other teeth from shifting out of place into the empty space. As far as its construction, the implant consists of a titanium replacement tooth root, an abutment that connects the root to the replacement tooth, and the replacement tooth (dental crown) that sits above the gumline. Only the dental crown is aesthetically visible. 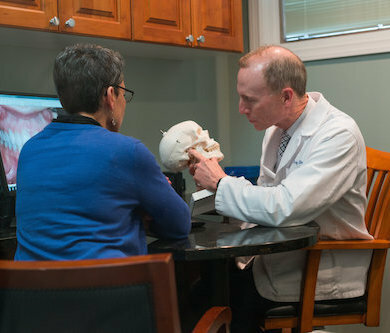 Dr. Sheridan will begin the implant process by examining the area to determine which implant is right for you. After the implant is set and the gums have healed sufficiently, Dr. Sheridan will create the dental crown and ensure proper fit and comfort. To help you better understand what dental implants can do to improve your dental health, schedule an appointment at our Grove City office. If you are interested in reviving your sparkling smile with durable, natural-looking dental implants, the trusted staff at Sheridan Dental are ready to answer your questions and serve you.